- Beautify your outdoor living space by hanging planters, flower pots, bird feeders, lanterns, mason jars, holiday decorations, wind chimes, ornaments and more! - A classic and timeless look that effectively embellishes your garden or event space. - 92 Inches tall minus 12 inches in the ground. - Endless applications! Use it in flower beds, at weddings, while camping, or even at gravesites. 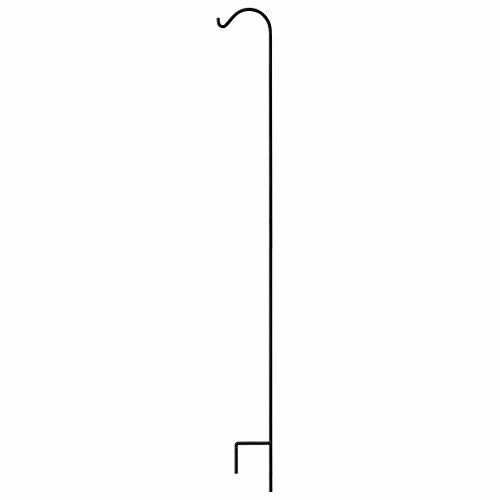 - With a dark finish and immaculate shine, this hook complements anything that you choose to hang on it. - Looks visually stunning in your flower bed or other locations. - Blends seamlessly into its surroundings and goes great with most other colors. - Premium quality metal that's thin yet sturdy, rust resistant and durable. 3/5 Inch diameter is thicker than similar hooks from other brands. Bring your heaviest bird house or flower basket! - Extra-long and double forked base prongs maintain a fixed, upright posture while remaining firmly planted in the ground. - Designed by the brightest minds, utilizing only the highest quality materials and expert manufacturing methodologies, GrayBunny offers premium products for your lawn and garden while exceeding highest industry standards and offering impeccable customer care. If you'd like your money back, no worries. Anytime. Just ask. Click the "Add to Cart" button on top to accessorize your outdoor living or event space now! MULTI-PURPOSE: Beautify your outdoor living space by hanging planters, flower pots, lanterns, garden lights, mason jars, wreaths and holiday decorations, string lights, wind chimes, ornaments, flower balls, ceramic birdbaths and more! A decorative freestanding mount to hang lamps, coconut \ coco-fiber \ moss baskets, humming birdfeeders and other accessories! PREMIUM QUALITY: We recommend avoiding any shepherd hooks that require assembly, are hollow, or have plastic parts, all of which are things which compromise hook integrity, look and strength. GrayBunny Shepherd hooks are single piece and strong solid steel. These garden stakes are also rust resistant. Double forked and extra-long base prongs at the foot of the rod maintain a fixed, upright posture while remaining firmly planted in the ground. Bring your heaviest pots and baskets! STYLISH: Traditional look and dark finish adds elegance and beauty to your garden. Stunningly complements anything that hangs from it. With a 3/5 inch diameter pole that is thicker than similar hooks from other brands, you can be confident you're getting the strongest shepherd's crook on the market! Double forked and extra-long base prongs at the foot of the rod maintain a fixed, upright posture while remaining firmly planted in the ground. Stands 92 inches tall, 82 inches long above the floor. VERSATILE: Endless applications include using them to hold insect repellents and bug zappers, shooting targets, isle markers, buckets of sand for ashtrays, a bird house \ bath or hummingbird swing in your yard, a sign holder (in lieu of a post) and more. Use it in flower beds, for aisle arrangements at wedding sites, while camping, or even at gravesites and graves at the cemetery. Constantly discover new and useful functions. GUARANTEE: GrayBunny offers premium products for your lawn and garden while exceeding highest industry standards and offering impeccable customer care. If you'd like your money back at any time within 6 months of purchase, just ask. Click the "Add to cart" button to adorn your outdoor living or event space with premium outdoor décor now! If you have any questions about this product by GrayBunny, contact us by completing and submitting the form below. If you are looking for a specif part number, please include it with your message.